Smooth Jazz guitarist delivers his second album. 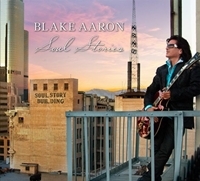 ‘Soul Stories’ is full of good time flavours such as ‘Groove-O-Matic’ and the tribute to Wes Montgomery ‘Wes Side Story’. Najee adds a nice flute solo to ‘Encantadora’ which compliments Blake’s switch to acoustic guitar. ‘You’re My Miracle’, the Latin tinged ‘Sol Amor’ and the cover of Hall and Oates’ ‘Sara Smile’ are also very nice smooth grooves.